Climbing hydrangea, also known as Hydrangea anomola, is a perennial vine valued for its fragrant, ornamental flowers and ease of care. The plant blooms during early to mid-summer, producing numerous white flower clusters. The plant's bark is light brown in color and peels off as the plant ages. Each climbing hydrangea vine can reach 60 to 80 feet in length, though any length can be maintained with proper pruning. Native to Asia, climbing hydrangea thrives in USDA hardiness zones 4 through 7, making it ideal for cultivation in most temperate regions of the country. Plant climbing hydrangea during mid-spring in a location that receives partial shade throughout the day and consists of moist, well-drained soil. 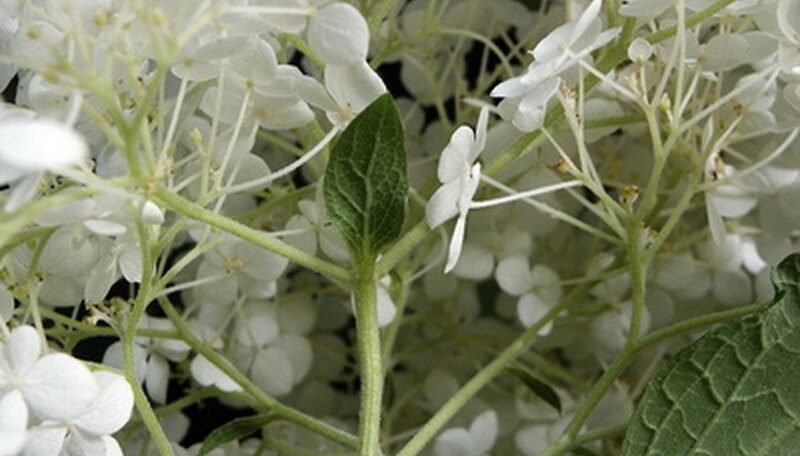 Space climbing hydrangea plants at least 24 to 36 inches apart to allow enough room for growth. Apply a 3- to 4-inch layer of organic mulch over the soil surrounding climbing hydrangea to insulate the soil, improve moisture retention and suppress weeds. Replenish the mulch as often as necessary to keep it at least 3 inches thick throughout the year. Water climbing hydrangea plants once every five to seven days to prevent the soil from drying out completely. Decrease the watering frequency to once every 10 days during winter, when active growth has ceased and the vine needs less water. Feed the plant three times per year, once in March, once in May and again in July, using a balanced 10-10-10 NPK fertilizer. Water it immediately after applying the fertilizer to release the nutrients into the soil. Apply the fertilizer at the rate recommended by the manufacturer for the best results. Prune climbing hydrangea immediately after they flower. Use pruning shears to remove bare, overgrown, damaged or diseased branches to increase the plant's health and appearance. Burn diseased branches at a remote location to prevent spreading the infection to other plants. Climbing hydrangea can also be planted during fall, if desired. Use pine bark or chopped leaves to mulch climbing hydrangea.